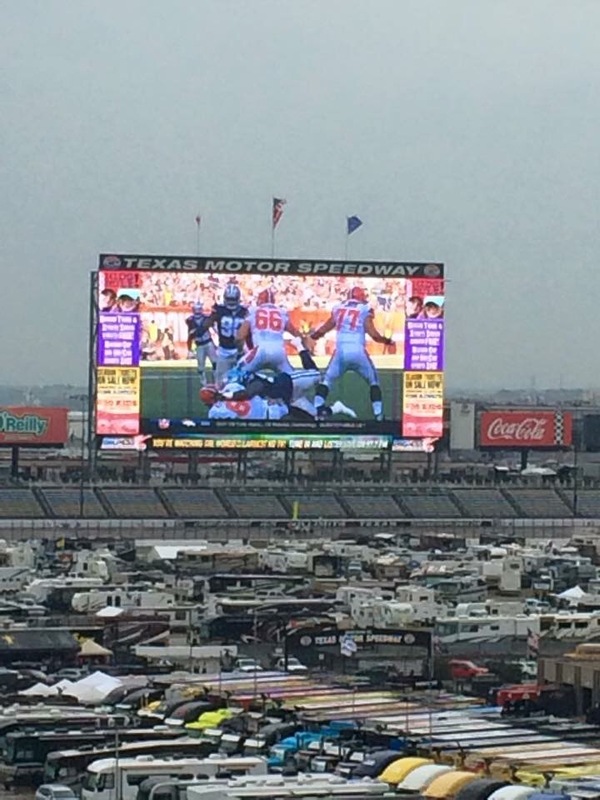 If you’ve never been to a NASCAR event and assume that the fans or either rednecks or hillbillies- you’re wrong! These are some of the most polite people you will ever meet and God fearing Americans who take off their hats and cover their hearts when the Pledge of Allegiance plays no matter where they are in the stadium or what they are doing! Everyone says excuse me and thank you at a NASCAR event. 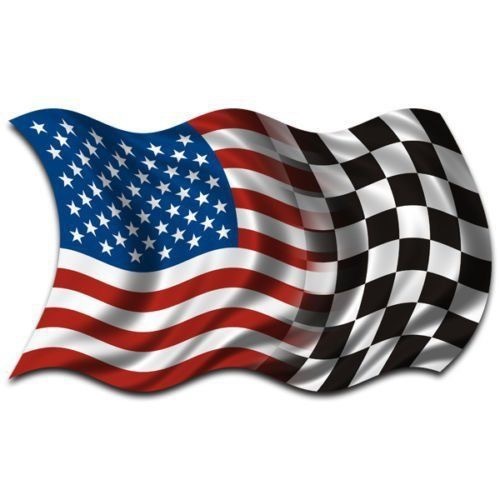 Fans are a melting pot of every background, race and religion with one thing in common- their love of motor sports and their love for America. The day started off a little cloudy but clear when my husband and I left WorthamWorld this morning to pick up my son and daughter at HafeleHouse before heading to Texas Motor Speedway this morning for my very first NASCAR race. Stopping at Whataburger for a breakfast on the run, I always laugh when we visit this Texas staple because I filmed a commercial with Mel Tillis years and years ago when I was a teenager and because my son always makes me say “It’s not a hamburger- it’s a Whataburger!” Although my twin sister Cindy and I are on a fairly strict diet- I opted for a Diet Coke and potato breakfast taco (with a side of salsa). Arriving at the raceway, our group hopped into a golf cart to ride to the pit stop and we all crossed our fingers that rain would pass over us. 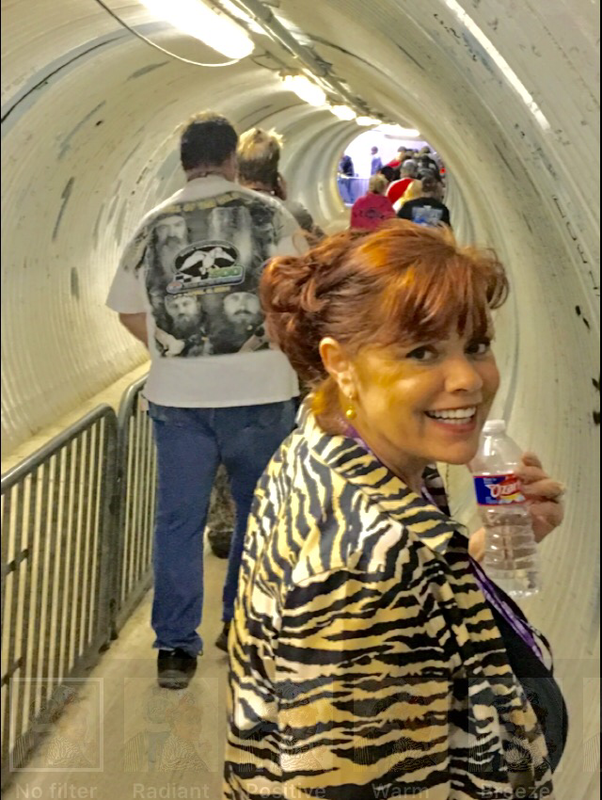 But, it was fairly cool and I found myself wishing that I had brought a coat-Golf Carts & Fun At Texas Motor Speedway! From watching the concert to actually being able to see the drivers announced after watching it on tv most of my life, the rain didn’t stop us from having a good time ya all! My daughter in law used her new FaceTime live to send a video and was pretty excited to be in the pit with us. 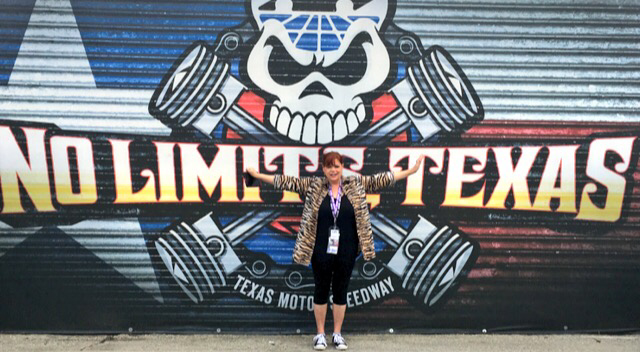 The last time I visited Texas Motor Speedway was for the GM Certified Cadillac Ride & Drive in 2003. 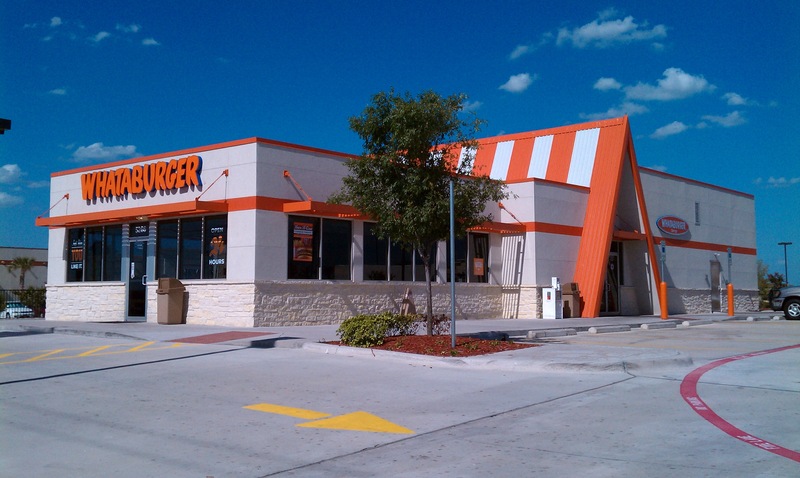 This track was where salespeople from all over the DFW area went to take our driving tests and every trip was exciting. 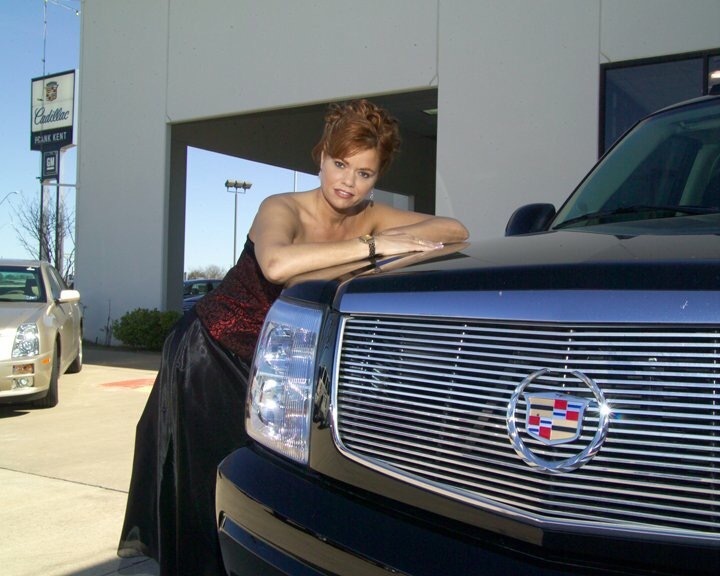 The V Series XLR was my favorite Ride & Drive for GM and I still have my award and gold ring from years of working at Cadillac, GMC, Hummer & Buick. I sold cars for a period of about 4 years while going through a divorce because top salespeople had the fringe benefit of a demo car and, I needed a way to earn money, get my son to school, etc. Occasionally, my family joined me in print ads too because we are ver close and because we do everything together. GM requires all salespeople to be certified and know everything there is to know regarding their products and that includes driving and handling. 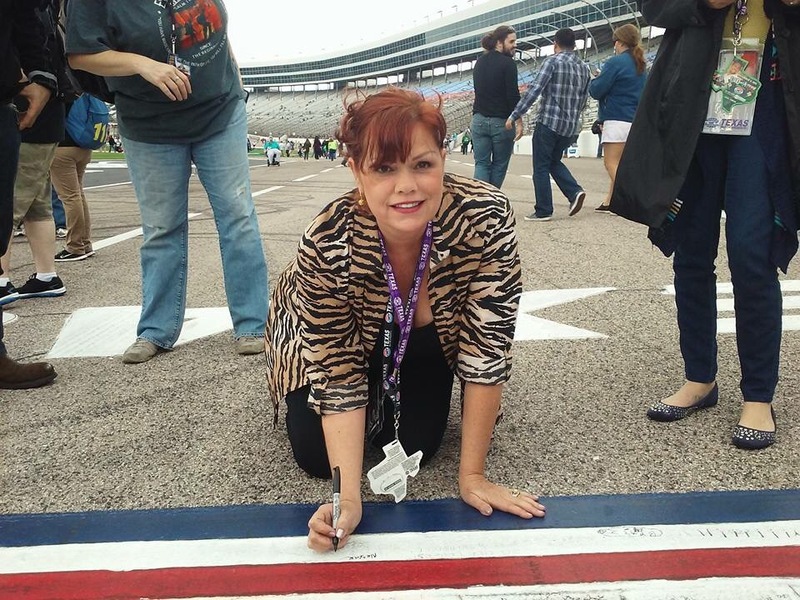 Ride & Drive’s can often have you riding and driving at very high rates of speed at Texas Motor Speedway and once, I nearly used my helmet after having a big breakfast and “buckling up” for a Cadillac XLR-V Series Ride & Drive that left me dizzy and nauseous! I had a lot of fun at Ride & Drive’s but I also had an edge of fear at high rates of speed which is why (even today) I don’t drive fast especially in the rain. 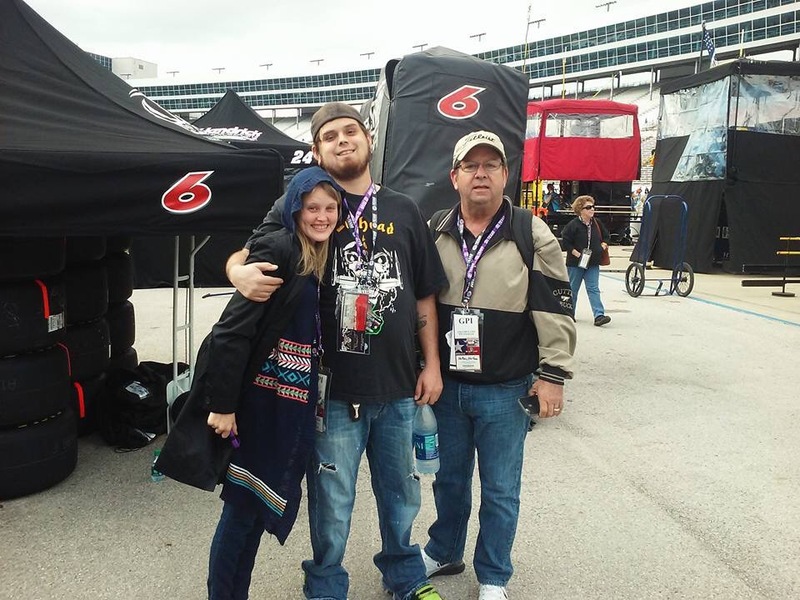 My husband and I decided to head home to check on our dog, Foxy Wortham and get out of the cold but my son and his wife decided to stay and catch a ride with friends that had checked in on FB at the Speedway. Robert just called me to say the race had finally started and I’m sorry we weren’t there to see it but I think everyone should attend at least one NASCAR event and feel the excitement of the fans.